IBPS प्रोबेशनरी ऑफिसर/मॅनेजमेंट ट्रेनी के 4252 रिक्तपदो पर भरती. IBPS PO 2018 released the notification for the recruitment of Probationary officers and management trainee, eligible candidates can apply for this posts. There are 4252 vacancies that released is for Probationary officers and management trainee this year, this is the big opportunity for those students who are preparing for banking exams. IBPS is one of the most awaited exam of the year, those aspirants who are studying long have a great opportunity to grab it. All the eligible candidates are able to apply online till 4th September for IBPS PO Application Form 2018. 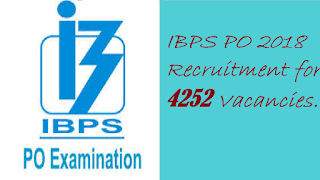 This year total 4252 vacancies are released by IBPS PO 2018 Recruitment CWE PO/MT-VIII. According to the notification, IBPS PO Prelims exam will be held in October and Mains exam in November 2018. To apply for IBPS PO/MT CWE-VIII exam candidates are advised to first check eligibility criteria. ➤ BECIL Recruitment for 105 posts. आयु सीमा : न्यूनतम: 20 साल, अधिकतम: 30 वर्ष, यानी एक उम्मीदवार का जन्म 02.08.1988 से पहले नहीं हुआ होणा चाहिये और 01.08.1998 से अधिक नहीं (दोनों तिथियां सम्मिलित). ऊपरी आयु सीमा अनुसूचित जाति / अनुसूचित जनजाति 5 साल, अन्य पिछड़ा वर्ग 3 साल, विकलांगों को 10 साल, पूर्व सैनिक को 5 साल. - left thumb impression (If a candidate is not having left thumb, he/she may use his/ her right thumb. If both thumbs are missing, the impression of one of the fingers of the left hand starting from the forefinger should be taken. If there are no fingers on the left hand, the impression of one of the fingers of the right hand starting from the forefinger should be taken. If no fingers are available, the impression of left toe 10 may be taken. In all such cases where left thumb impression is not uploaded, the candidate should specify in the uploaded document the name of finger and the specification of left/right hand or to a handwritten declaration (text given below) (In case of candidates who cannot write may get the text of declaration typed and put their left hand thumb impression below the typed declaration and upload the document as per specifications). ensuring that the all these scanned documents adhere to the required specifications as given in Annexure III to this Advertisement. written by anybody else or in any other language, the application will be considered as invalid. (vii) have a valid personal email ID, which should be kept active till the declaration of results of this round of CRP. IBPS may send intimation to download call letters for the Examination etc. through the registered e-mail ID. Under no circumstances, a candidate should share with/mention e-mail ID to / of any other person. In case a candidate does not have a valid personal e-mail ID, he/she should create his/her new e-mail ID before applying online and must maintain that email account.